Shakespeare can mean lots of laughs, but community theater Shakespeare in Loudoun has been a rarity—until now. Run Rabbit Run Theatre presents a funny and fresh production of “Much Ado” Aug. 10-12 at Franklin Park Arts Center. Leesburg-based writer, producer and director Meredith McMath thinks locals will turn out for a homegrown production of one of the bard’s best. And she’s assembled a cast of talented young actors from around the DC region to help prove it. The play, which centers on the parallel romantic tribulations of two very different couples, is one of Shakespeare’s best-known and funniest comedies. It’s also a work with plenty to say to 21st century audiences, McMath said, and her job as director is to help actors to tap into the play’s timeless themes and humor. “You have to know what the content means and you have to take it and lay it right under there so that you’re going with the flow of a modern emotion,” McMath said, and that means making sure the audience gets the play’s wit and humor—including a few dirty jokes. “The emphasis is on comedy and playing to the pit, playing to the regular folk which it does,” she added, a likely reason it’s one of the most performed Shakespeare plays in the U.S. But community theater audiences tend to expect musicals, McMath said. So she was thrilled when a cadre of Shakespeare-loving actors from across the DC metro area came out for auditions. McMath has taken Shakespeare’s story of soldiers coming home from war in 16th century Sicily and moved it to post-World War II America, where a group of soldiers are invited by local official Leonato for some R&R. While the soldiers do their best to bring Beatrice and Benedick together, the brave but emotionally immature Claudio, pursues Leonato’s beautiful and innocent daughter Hero. But that romance takes a hit thanks to the soldiers’ leader Don Pedro and the jealous machinations of his villainous brother Don John. Played as a woman in the Loudoun production by Heather Louisa Valdez, the scheming Dawn John successfully tricks Claudio into believing that Hero has been unfaithful, leading him to abandon and humiliate her on their wedding day. Spoiler alert: like most of Shakespeare’s comedies, the story has a happy ending, but not before a rowdy brawl scene, a heartbreaking misunderstanding and lots of laughs. And local theater lovers will enjoy terrific performances from some familiar and not so familiar faces. 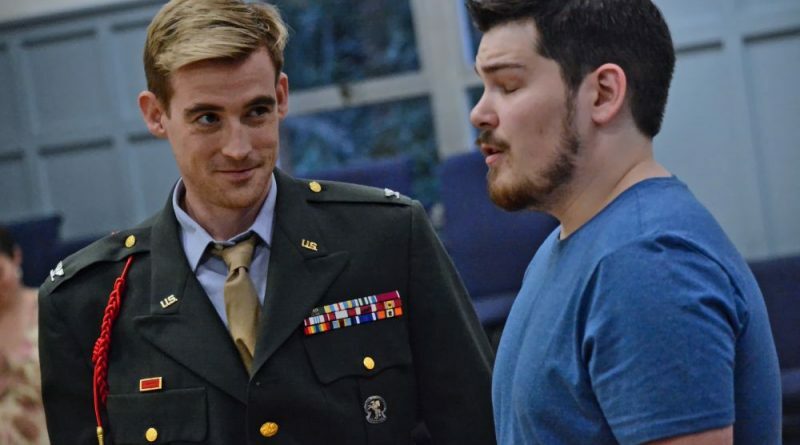 Leesburg’s Ryan Bultrowicz, a Loudoun County High School graduate and now a rising senior at Longwood University where he recently played “Macbeth,” plays Benedick to Louis’ Beatrice. “If I were going to dream up the most perfect Benedick and Beatrice in my mind, they are it,” McMath said. Alexandria-based David Pesta, who recently completed a graduate program in classical acting at George Washington University, is commuting to Loudoun to play the aristocratic Don Pedro while audiences will recognize Run Rabbit Run veterans Scott Tousley as Friar Francis and Doug Dickinson as Leonato. Julian Baldwin, who played Willy Wonka in VSA Loudoun’s spring musical gets plenty of laughs as Dogberry, the head of Messina’s night watch, while professional actor and teacher Jessica Johns makes the role of Dogberry’s colleague, Hugh Oatcake, her own. Another LCHS alum, Hofstra University student Drew VanDyke plays Claudio, and the show’s youngest actor, 19-year-old Victoria Sova earned the role of Hero. Sova graduated from Marshall High School in Vienna this year and will study acting at the National Conservatory of Dramatic arts in DC. As Sova observes, Claudio comes back from the war with trust issues that makes him vulnerable to Dawn John’s treachery. And postwar America, she said, is a perfect setting for the play, with the elation at the U.S. victory balanced by soldiers’ struggle to process what they’d been through, meshing perfectly with Shakespeare’s brilliant balance between giddy joy and mistrust and betrayal. And both McMath and her cast think the intimate setting at western Loudoun’s Franklin Park Arts Center is ideal, offering the accessibility that Elizabethan theaters were built for and plenty of opportunities for audience interaction. 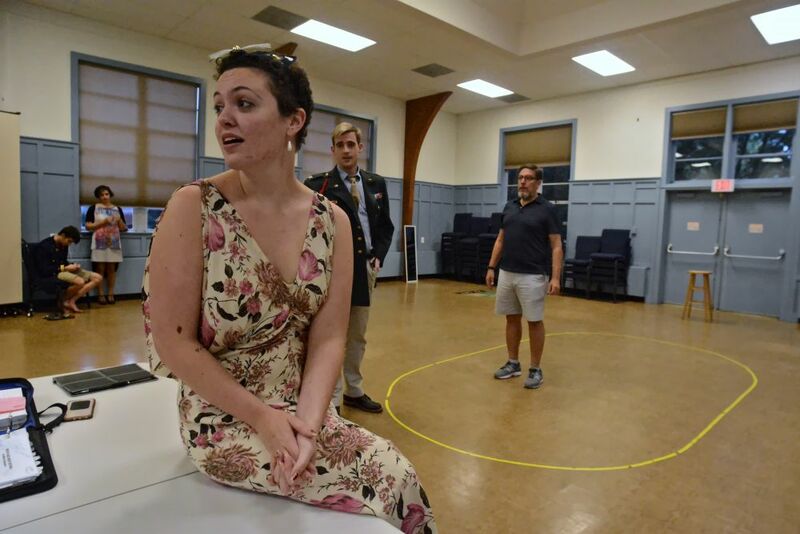 Run Rabbit Run Theatre’s “Much Ado About Nothing” runs 7:30 p.m. Friday, Aug. 10 and Saturday, Aug. 11 and 1:30 p.m. Sunday, Aug. 12 at Franklin Park Arts Center in Purcellville. Advance tickets are $15 for students and $20 for adults—add $5 at the door. Discounts are available for groups of five or more. For tickets and information, go to rrrtheatre.org.